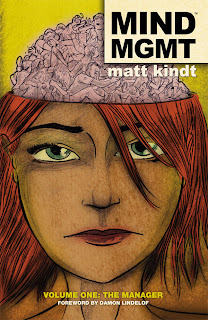 It's hard to say much that's specific about Matt Kindt's Mind MGMT Vol. 1: The Manager without spoiling the whole thing. It is in the conspiracy theory genre, owing its roots to shows like The X-Files (and certainly earlier than that) though perhaps stylistically having more in common with Lost (beyond simply Damon Lindelof's introduction). It has an element of meta-fiction to it, a la David Foster Wallace's Infinite Jest. Mind MGMT, for another comparison, might be what Cameron Stewart's Sin Titulo (which I'll be reviewing soon) would have been if it were an ongoing series, or vice versa if Mind MGMT were a webcomic. Mind MGMT requires more from the reader than I originally expected. A keen eye, for one, but mostly patience. The core of the book is a mystery, and that mystery does not unfold quickly. I understand Kindt conceptualized Mind MGMT as a book readers would want to read in monthly installments so as to be able to pore over and discuss the book's puzzles; for me, this would have been tough. While reading, I considered I might have dropped the series around the third issue; having finished, however, I'm keen to pick up the soon-to-be-released second volume. The message is, if you're going to read The Manager, commit to reading the whole thing before passing judgment. Though the story is difficult, it's hard to beat a creator-owned book written and also drawn by that creator (ditto for Sin Titulo), and Kindt's sketched-out style is nicely different than anything else you'll find on the stands today. Many, though not all, of the concerns I had about Mind MGMT were solved by the book's conclusion. What exactly has Meru been doing with her life since her first bestseller? If she wasn't on Amnesia Flight 815, why does she seem so out of it? Why does she take for granted the existence of talking dolphins, or that Bill is a CIA agent working for her best interests? I'm still a little fuzzy on the Bill part, but the rest we get -- it's because Meru has done all of this before and so she's operating with a certain amount of deja vu, which the audience, at least at the outset, doesn't have the advantage of. The payoff is sufficient for the reader's struggle, but reading the book is not without said struggle. Meru isn't a well-defined character -- we don't know her likes, dislikes, friends, etc. -- and at some point as she runs hither and yon across rooftops with Bill, trying to escape the Immortals, it's hard to care about Meru as a character beyond watching a good action scene. Additionally, of the six issues, almost a full two are given over to the origin of Mind Management agent Henry Lyme, such that Meru is less the protagonist than simply the vessel through which Kindt delivers the reader Lyme's story. Much of this, again, is cleared up by the end, but the overall effect causes Mind MGMT to lack the depth of Saga or Sin Titulo, though that's plenty good company to be in. I even wonder, with no foreknowledge of what's coming up, whether Meru will remain this book's protagonist, or if Kindt will focus on another character in the next book. Having read some of Kindt's two-page profiles of other Mind Management agents, I can see there's plenty other stories to tell in this world (as Brian Vaughan sometimes turned the focus to characters other than Yorick and company in Y: The Last Man), and it would not surprise me if Kindt set Meru aside for a storyline or two, though I'd be equally glad to have her in the next book for the audience to learn more about her now that we have a clearer picture what's going on. What makes Mind MGMT remarkable is what also makes books like Watchmen remarkable -- the sheer volumes of extraneous artifacts the author creates for telling the story. In the case of The Manager, this is mainly the Mind Management Field Guide rules that Kindt prints along the side of nearly every page, almost 120 of them in all. This certainly required a considerable amount of planning and plotting, as each rule ties tangentially to the action on the page. Though this is one of the things that "sold" me on Mind MGMT, I'm ready for Kindt to try a new "trick" in the next volume -- it was entertaining but at the same time sometimes distracting to have to read the side of the page every page, making ongoing scenes seem stilted. The book is at its most effective, however, when the rules on the side of the page begin to morph into secret messages that speak directly to the reader. The reader becomes a character, as it were, holding this "found object" of the guide pages. It seems relatively clear in the book that when Meru writes about what she learned from Lyme and mails it to herself, she actually writes it, but art factors strongly in the book (the animal that everyone is drawing), so perhaps The Manager is meant to be Meru's ultimately-lost pages, or even perhaps her writing is being "translated" to images for the reader via some Mind Management technique. The idea of The Manager-as-hastily-scribbled-notes goes to explain the particular "sketched" look of Mind MGMT, too. Perhaps, between Mind MGMT and Sin Titulo, this kind of paranoia-laced secret government agency tale is reaching market saturation; at the same time, I can't help but be sucked in. In its middle, Mind MGMT Vol. 1: The Manager doesn't offer as much detail as I'd like, but its final question -- how will Meru surmount the tricks of her own mind? -- is very enticing. I'll stick with this one for the next round. Green Lantern reviews coming up later in the week. Don't miss it! The Mind MGMT HC is really beautiful. I love these European album style hardcovers with no dustjackets. The previews for Francisco Francavilla's Black Beetle hardcover look like its in the same format. Can't wait. Yes, I liked this, too; the size/shape of the hardcover helped lend it that "found artifact" feel to me.